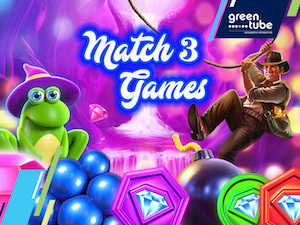 Greentube is expanding its casino games portfolio with the Jewels Match 3, Secret Trail Match 3, Sparkling Fruit and Jinxy Match 3 titles. The company's games combine match three gameplay with that of a traditional slot. The "match for cash" character of these games gives players the possibility to play for real money. In addition, Greentube is working to add more titles to its Match 3 portfolio with additional bonus features, extended gameplay and much more.